It’s not often that you get to stand at the bottom of a continent, but that was the case today for our tour group. Today was our day to drive down to the two great capes below Cape Town, though we first were treated to a lovely seaside drive past a host of small formerly fishing communities. We then drove the Chapman’s Peak Drive, which many regard as one of the most dramatic drives on the continent. We stopped a couple of times to marvel at sea and sand, and of mountain heights that crash downwards at impossible angles. At long last we came to the Cape of Good Hope. Next stop further south – Antartica? We stopped for photos, and then made our way to nearby Cape Point. Good Hope is as low to the sea as Cape Point towers above, by 280 meters or so. With banks of clouds rolling in it all made for a dramatic view. Oh yes, and the baboons, ostriches and even a couple of great elands were spotted along the way. Did I mention the Southern Right Whales? We could see them just below the surface of the water as we gazed down from Cape Point. We had lunch in Simon’s Town, a key naval base for the British, from which the Antarctic expeditions of Shackleton, Scott and others left. Now it is more of a quiet colonial town. 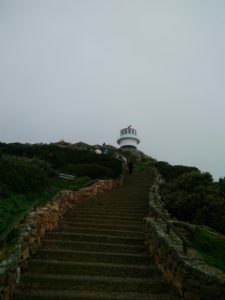 We ate, wandered, and then drove a kilometre down the road to the famed Simon’s Town penguins. Are there any more charming animals in the world? From there we drove home where we put our feet up for a bit before gathering at a local Italian restaurant for our evening meal, and yet more conversation. We ended our day with the chance to sit and listen to Marvin and Sylvia, of our group, talk about the 3 years they spent in the early 1990s as volunteer physicians at a rural hospital in Zimbabwe. More than once we’ve talked on this tour about the sense of community and care that marks almost every TourMagination trip. This evening, that sense of community building was again richly evident as we listened to Marvin and Sylvia, and as those in our group were swept up in their remarkable experience of generous volunteerism.